Beat the Wand! Andrew James and Magic Sam Proudly Present... Beat the Wand! A new, fun, late-night event that will take place at the Blackpool Convention immediately following the Saturday Night Intercontinental Stage Show between 11pm and 1am. 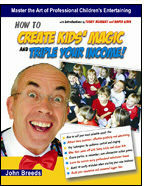 Here's the outline: "By kind permission of Derek Lever, Andrew James and Magic Sam Proudly Present... Beat the Wand! A competition that anybody, with any sort of act may enter using magic, juggling, mentalism, comedy.. anything, as long as you have a five minute act. The three judges will be randomly picked from the audience and changed regularly throughout the evening. Ten contestants will compete. 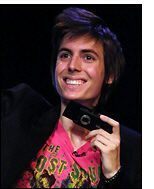 Each contestant has to attempt to entertain the audience for five minutes without being voted off. Each judge will be given a giant wand. When a judge becomes bored or has had enough of the act, they will raise their wand in the air. As soon as there are three wands in the air the act is stopped. Once the acts reach three minutes, a bell will ring, signalling that they “Beat the Wand” and they will be allowed to complete their act. Finalists will then return to the stage and a winner will be decided by ‘Clap-o-Meter’. The event will be overseen by the comperes, Magic Sam and Andrew James to ensure that none of the audience are being over zealous or biased with their eliminations! Entrants should bear in mind that the stage is very small and they will only have ninety seconds to enter and exit. To alleviate the Saturday night ‘Ruskin Rush’, Beat the Wand is taking place straight after the Saturday Night Intercontinental Stage Show from 11pm to 1am in the Theatre Bar, Winter Gardens (the rear room of the Galleon Bar). What’s the big prize? Honour and the glory of being able to say that you were the one who “Beat the Wand”. As if that wasn't enough, there will also be a trophy, an “I Beat the Wand” t-shirt, and a gold ticket for next year's convention! Beat the Wand will give convention attendees the opportunity to get up on stage and perform for a substantial, appreciative and energetic audience. We want to encourage new talent - throw caution to the wind and get up there and give it all you've got! We want old and young, amateur and pro on that stage, side by side, giving it all they’ve got. 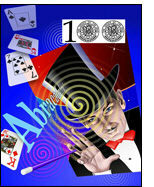 The emphasis will be on entertaining an audience. So a Dippy Duck routine might beat a 38 coin matrix, or a five minute, one balloon routine might beat billiard balls. Or not! We’ll have to wait and see. 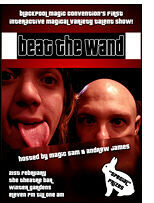 Beat the Wand will be a raw, fun, down to earth, ego-free evening with a real emphasis on entertaining an audience."